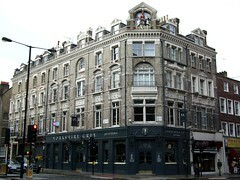 Busy, noisy pub on the corner of Theobald's Road and Grays Inn Road in Holborn. Kake, Nick, and others visited on a Wednesday evening in August 2008. Beers available were Deuchars IPA, Spitfire, and London Pride (there was a turned-around Bombardier clip as well). It was very busy when we arrived around 6:30pm; the interior was packed and there were people standing outside as well. Music was quite loud, and in combination with the number of people in, this made it quite difficult to conduct conversations with more than one person at a time. The evening menu is served between 4pm and 9pm. Kake and Paul shared the New York Platter (£15 to serve two), which had a decent enough burger, a Southern fried chicken wrap, a bowl of spiced potato wedges, a couple of corn-on-the-cobs (corns-on-the-cob? ), and a small bowl of coleslaw. The burger and wrap were each cut in half to facilitate sharing. The potato wedges had a texture characteristic of the microwave, and the rather starchy-tasting corn-on-the-cob had been reheated too, though it did show evidence of having been grilled at some point. The coleslaw was perhaps the high point, being home-made style rather than standard catering stuff. Overall, it was edible, but not something you'd specifically seek out - a little surprising, since it's currently billing itself as "Yorkshire Grey Pub and Kitchen". They offer free wireless internet (verified by a couple of people in our party). You can book tables, and there's also a bookable function room upstairs (don't know if there's a charge or a minimum spend for the room, though). Last visited by Kake, Nick, and various freebase.com people, 20 August 2008. Last edited 2013-05-10 08:20:20 (version 8; diff). List all versions. Page last edited 2013-05-10 08:20:20 (version 8).